A nuclear device has been hidden in a high-rise building in a major metropolitan area. Emergency responders have intelligence that narrows down the location to a single city block, but it is not safe to search door-to-door. Can they identify the exact location of the device quickly without the culprits realizing a search is on? The answer is a definite yes. 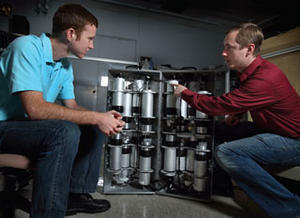 Sandia Lab’ mobile imager of neutrons for emergency responders (MINER) system did just that at an emergency response exercise in downtown Chicago earlier this year. The exercise used a sealed laboratory radiation source that mimics the radioactive signature of more nefarious material. A nuclear device has been hidden in a high-rise building in a major metropolitan area. Emergency responders have intelligence that narrows down the location to a single city block, but it is not safe to search door-to-door. Can they identify the exact location of the device quickly without the culprits realizing a search is on? The answer is a definite yes. Sandia National Laboratories’ mobile imager of neutrons for emergency responders (MINER) system did just that at an emergency response exercise in downtown Chicago earlier this year. The exercise used a sealed laboratory radiation source that mimics the radioactive signature of more nefarious material. A Sandia Lab release reports that MINER is a portable version of the neutron scatter camera, which detects fast neutrons that emanate from special nuclear material to pinpoint the source, even at significant distances and through shielding. Funding for the development came from the Defense Nuclear Nonproliferation Office of Research and Development within the Department of Energy’s National Nuclear Security Administration. The original neutron scatter camera was quite large, standing about 5-feet tall and requiring a power source. MINER is about half that size at 3-feet tall and 90 pounds. MINER consists of sixteen proton-rich liquid scintillator cells arranged inside a large cylinder. The scatter aspect comes into play as neutrons travel through the scintillator cells and bounce off protons like billiard balls. Those interactions among the different detector cells enable the instrument to determine the direction of the radioactive source that emitted the neutrons. As a neutron scatter camera, MINER has several advantages over other types of detectors, including the ability to discriminate the device signature from background radiation and to measure the spectrum of neutrons emitted by it. MINER can be set up and taken down in ten minutes, and most importantly, operates on battery power. “Since MINER doesn’t need to be tethered to a power source, it gives a lot of options to emergency responders,” said Goldsmith. The Chicago field exercise focused on neutron detectors, so MINER was one of three neutron imagers tested along with several neutron counters. It wasn’t a competition, explained Goldsmith, but a test of each detector’s capabilities. “There are tradeoffs with every kind of detector. If you are trying to pinpoint a source, a backpack detector might be the fastest, but there are scenarios in which walking around isn’t possible,” he said. MINER also is a two-for-one detector. The system was designed for neutron imaging and spectroscopy, but its proton-rich liquid scintillators also can capture gamma rays. While not the most efficient or effective gamma ray detector, MINER’s design makes it suitable for several unusual applications. “When used as a neutron scatter camera, MINER is closed. But if we open it up, we can position MINER near a radiation source and gather additional information about that source. This could be very useful in determining how to handle an object that is emitting radiation,” explained Goldsmith. The release notes that future work on MINER includes expanding and refining its measurement capabilities and participating in a search scenario at sea.